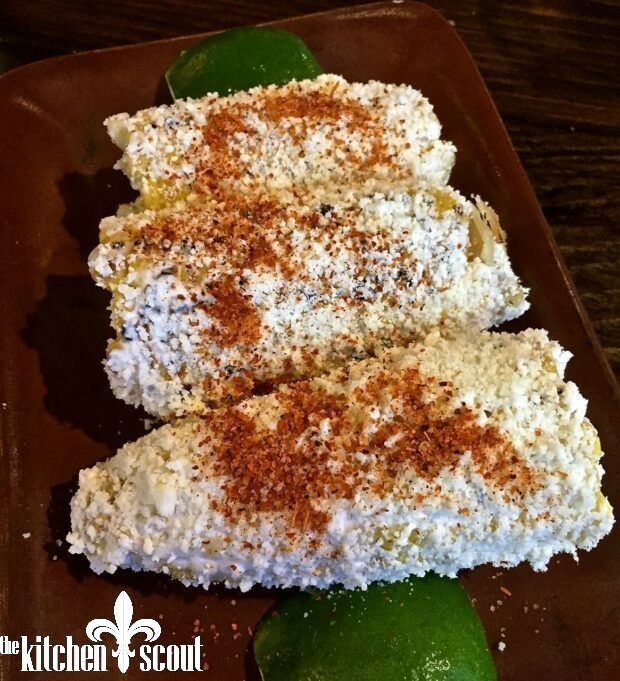 Charred corn is slathered with Mexican crema or mayo and rolled in cotija cheese and some chiles. Lime wedges are served alongside. It’s completely delicious and worth the splurge, but hard to eat delicately. Turn those ingredients into a salad however, and it’s perfect for a buffet luncheon like the one we plan to serve. We are splitting up the cooking and this salad is one of the things on my list. 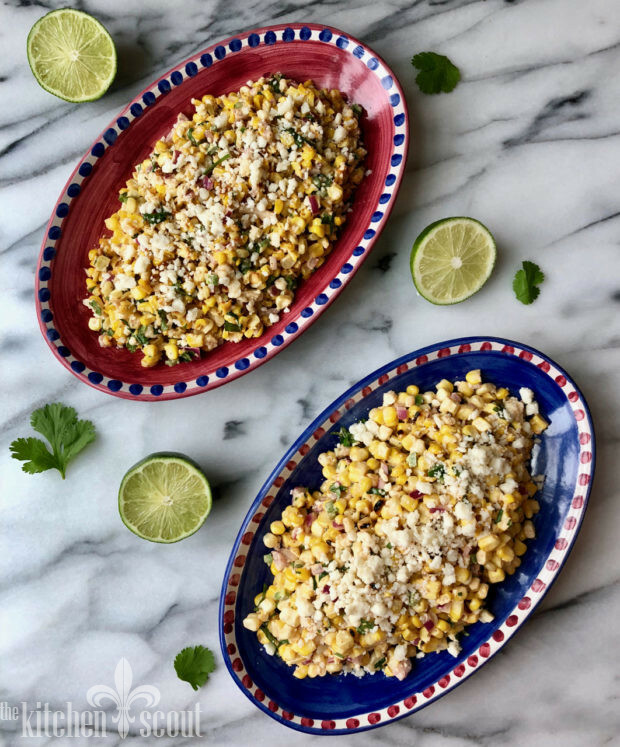 Since I didn’t have a tried and true recipe for Mexican Street Corn Salad and didn’t want to wait until the last minute to figure one out, I thought I would try to do some research and recipe testing this week. After looking at quite a few recipes online, comparing the various methods for preparing the corn and analyzing the use of different ingredients and spices, I settled on a recipe from Food 52 via foxesloveslemons.com. Corn, a can of green chiles, red onion and cilantro are mixed with a spicy dressing and cotija cheese. Yes, please. I liked the recipe, but wanted to test a few things and make one substitution of a fresh jalapeno for the canned chiles. Beyond that, here’s what I was thinking. First, the recipe called for roasting the corn kernels in the oven to get that charred texture. I was curious about how grilling the corn might affect the dish so I tried that too. I also wanted to tweak the dressing ingredients which consisted of mayo, sour cream, lime juice, fresh garlic and some seasonings. I decided to swap out the fresh garlic with garlic powder in case the fresh was too sharp, the sour cream with creme fraiche to see if it more closely mimicked a crema and I added some smoked paprika to the other seasonings of chili powder and cayenne for some extra depth of flavor. To test all these variables, I divided the recipe in two and made one half according to the recipe’s instructions and the other half with my changes. As for the dressing, it’s a toss up between the sour cream and the creme fraiche, but the fresh garlic was very nice and I liked the addition of the smoked paprika. As is always the case with recipes on this site, please feel free to add or subtract ingredients to suit your palate. Taste as you go and if you want things spicier, then add more chili powder or cayenne. If you want more cheese, go for it! Since it is Cinco de Mayo next weekend, I thought I would post the recipe so you could incorporate it into your celebrations as well. 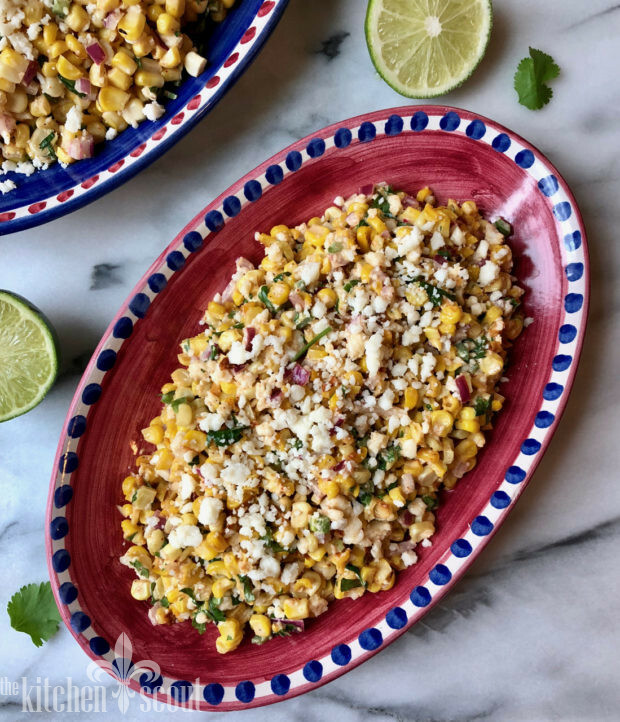 I think you will really enjoy this salad whether you make it with grilled or roasted corn, leftover corn or even roasted frozen corn from Trader Joe’s (I’ve provided cup measures). It would also make a fantastic appetizer if you served it in little cups with spoons. A caterer did this for a party I attended and it was my favorite dish of the evening! 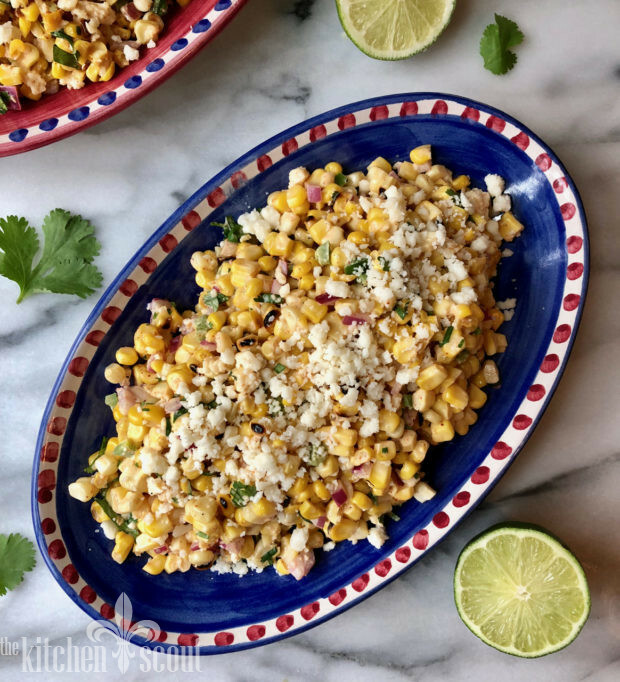 Why not give Mexican Street Corn Salad a try? And with sweet summer corn, this dish will be even better! Footnote – this is the week when I have sometimes written a post about the Armenian Genocide which we commemorate on April 24th. This year marked the 103rd anniversary of the Genocide, the first genocide of the 20th century. I am here only because some members of my family were able to safely leave their homeland and build a new life here in the United States. To learn more, please read my past posts for 2017 and 2015. Recipe adapted from Food 52/foxesloveslemons. This recipe is perfect for your Cinco de Mayo celebration or as part of any buffet alongside grilled meats or fish. You could also make this with leftover corn or with frozen roasted corn in a pinch. Serve at room temperature. Great leftover as well! Enjoy! To roast the corn, preheat the oven to 375 degrees with a rack in the center. Line a sheet pan with parchment paper. Cut kernels from the cob and spread in an even layer on the pan. Roast the kernels for 20 minutes or until golden brown, stirring half way through the cooking time. Remove from oven and allow to cool slightly. Place in a large bowl. To grill the corn, place a grill pan over medium high heat or light your grill. Brush the corn lightly with the grapeseed oil. Grill, turning frequently until the corn is slightly charred and tender, about 10-15 minutes. Allow to cool slightly and then remove kernels from the cobs and place in a large bowl. Add the jalapeno, red onion and cilantro to the bowl with the corn kernels. In a separate bowl, whisk together the lime juice, mayo, sour cream, 1/2 cup of the cotija cheese (see Tips if using grilled corn), the spices and salt until combined. Taste and adjust to your preferences with more heat or lime. Add the dressing to the bowl with the warm corn and mix until all ingredients are combined. Pour the salad onto a platter and sprinkle with the remaining 1/4 cup of cheese. If you choose to grill the corn, increase the cheese to 1 cup, using 3/4 cup in the dressing and the remaining 1/4 cup sprinkled on top. Served this last night. I grilled the corn and used the creme fraiche. I cut back on spice – half a jalapeño as tribe is sensitive. It was amazing. Grilling made corn “nuttier” then roasting. I grilled the corn in the morning and swerved all slightly chilled. Excellent! Glad it was well received! This looks delicious. A perfect summer side, it will go into rotation. Thank you, Susan! Summer corn – can’t wait for that! This sounds delicious! Can’t wait to make it and shared it with my daughter. Oh yay, Marta! I hope you enjoy it!